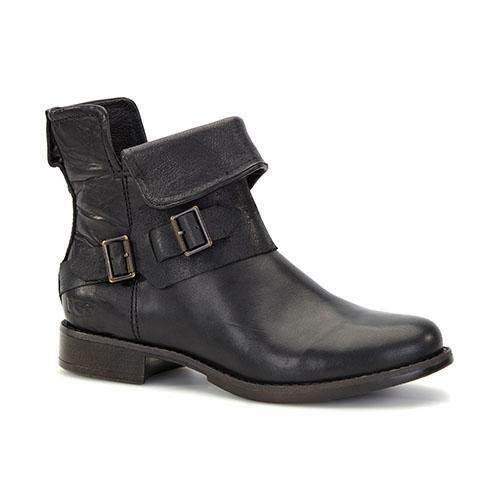 From the Rylie collection by UGG Australia the Cybele is a super-soft leather short motorcycle boot with built in flexible wire that allows for styling and folding of the topline. Features distressed leather monk strap with double buckles, that have custom grid texture roller detail, and medial antiqued metal zipper. Fully lined 7mm curly sheepskin sockliner over foam cushioned footbed to keep feet comfortable, warm and dry. Also features a 1" leather-like finish molded rubber heel and outsole with decorative nail heads at arch and leather welt stitch construction. 7" shaft length.